The route of the Brockholes Geotrail does not encounter solid rock geology, but the Lancashire Wildlife Trust reserve owes its existence to the geological history of this part of the Ribble valley. The glacial history of the area and the geomorphology of the Ribble valley are the key themes in this document. The aim of this background material is to put Brockholes in its geological context, to relate the rocks which are to be found here to the stratigraphy and to link the geology of this area with that found elsewhere in the Geotrail series. There is often a change in the orientation of the beds above an unconformity. The older beds often show evidence of folding and/or faulting, followed by subsidence. The next period of deposition, usually under water, lays down horizontally bedded rocks, so that the unconformity is clearly identifiable. Probably the most famous unconformity is that described in 1788, by James Hutton, on the Scottish coast between Edinburgh and Berwick on Tweed, at Siccar Point. 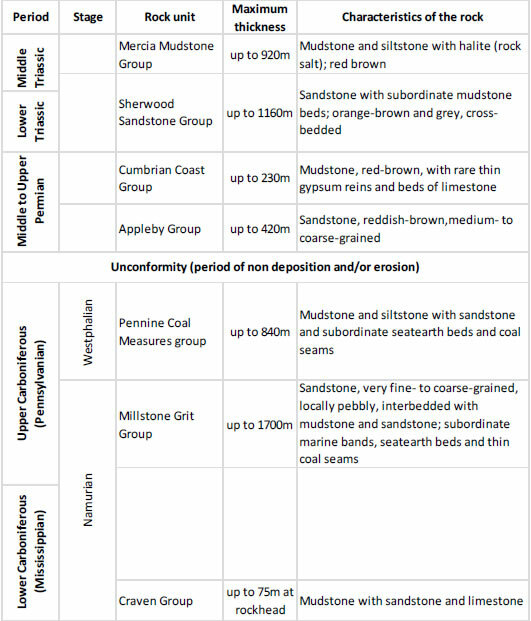 The Carboniferous/Permian unconformity does not appear at the surface in Lancashire and it seems likely that there is no significant change in orientation of the bedding. It has however been proved in boreholes. The Collyhurst sandstone, a Permian rock, is absent east of Preston, where the Triassic Sherwood sandstone rests directly on the Millstone Grit Series. 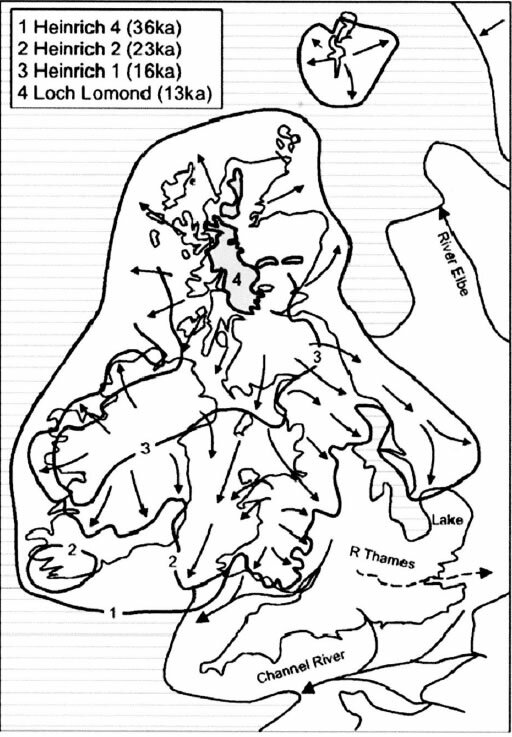 The Triassic rocks in the area of Brockholes are buried beneath more recent deposits, mostly associated with the effects of glaciation, which will be discussed in Section 4. Figure 4 The geology of the area around Brockholes as shown in two geological maps produced in the 1920s at a scale of Six Inches to One Mile. The river Ribble can be seen meandering across its floodplain. Brockholes reserve is in the large curving meander at the junction of the two map sheets. 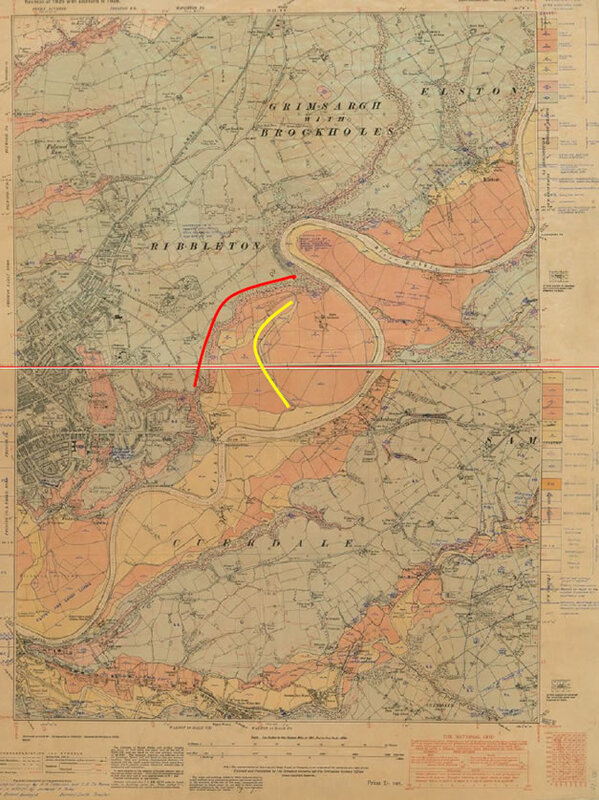 On this map it is possible to identify two older channels, one making the northern edge of the valley (in red) while the other (in yellow) curves across the western edge of the reserve (next to the M6 motorway not shown on this map). 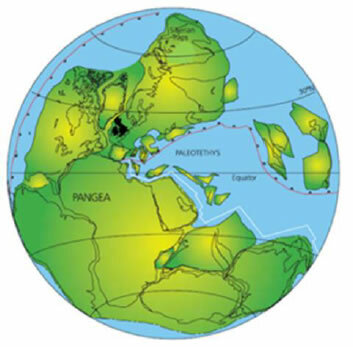 The Triassic rocks which underlie this area were deposited at a time when the British Isles were located some distance north of the Equator, in the tropics, as shown in Figure 5. The environment was very similar to that of the Sahara Desert today, with almost no maritime influence, so very little rainfall. Temperatures would have been those of a hot desert climate with a large diurnal range and very little seasonal variation. The red colouration of the sandstones is typical of desert deposition, where the iron content of the rocks is oxidised giving the ‘rusty’ red colour. A close examination of these sandstones also gives clues to the environment of deposition. Where the climate is hot and dry, very little vegetation is able to survive, so that the land surface is exposed and wind erosion is the most common agent of erosion. Sand particles are picked up by the wind and may be carried many miles before being deposited, often in sand dunes. During this process, the particles collide and become rounded and frosted. If the sand is deposited in dunes, the particles will be small and almost uniform in size. The wind is not able to carry particles of large size. The salt deposits of the Preesall area are indicative of an area of inland drainage, rather like the Dead Sea, where evaporation exceeds precipitation and evaporite minerals including halite, gypsum and potash may be evaporated from saline water. Despite the general lack of rainfall in deserts, water is a major agent of erosion. When rain falls, it does so in violent, torrential storms, resulting in flash floods. These floods carry enormous quantities of sediment, which are then deposited as the water ceases to flow. Because the sediment is carried for a short time and over relatively short distances, there is no time for the particles to be rounded, so deposits of this sort are characterised by being made up of angular fragments of a variety of sizes. In addition, if the sediment is derived from granite and contains the mineral feldspar, which decays to clay minerals in humid conditions, it will often contain feldspars and be described as arkosic. Several of the coarse-grained Carboniferous sandstones of the Lancashire moorlands, including the Rough Rock from which the beacon on Rivington Pike is built, are arkosic, see Figure 6. During the past million years, there have been several periods of glaciation, see Figure 7. The last of these, between 75,000 and 15,000 years achieved its maximum about 24,000 years ago when glaciers eroded parts of the western Scottish mountains and the Lake District. Two of the ice advances, Heinrich 4 and Heinrich 2, covered the Brockholes area, but the two most recent advances did not reach this far south. Particles varying in size from rock flour (finely ground rock) to boulders, became entrained in the ice. Glaciers, often as part of an ice-sheet, moved inexorably southwards. Those from Scotland made their way across Morecambe Bay while those from the Lake District moved south through Yorkshire and Lancashire. 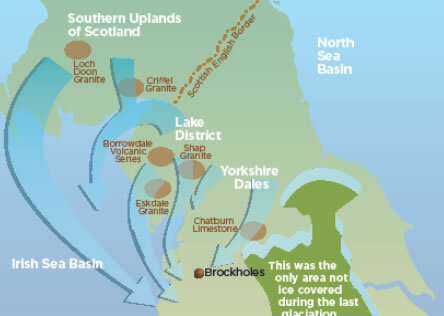 Figure 8 shows that the ice covered Lancashire and Cheshire and got as far south as Wolverhampton. Brockholes lies south-east of the Kirkham moraine, a feature created when the rate of ice melt is equal to the rate of movement of the ice sheet. If this pertains for a period of time, the ice sheets ‘load’ is deposited as a line of moraine. As the climate began to warm at the end of the period of glaciation, the ice melted over large areas. As the ice-sheet melted, the suspended load, varying in size from rock flour to boulders, was deposited. Such a deposit used to be known as ‘boulder clay’ and that name will be used in this account. Geologists now use the phrases ‘glacial till’ or ‘diamict’ (These terms have slightly different meanings but are used interchangeably). In this part of Lancashire, around Brockholes, the boulder clay was originally at least 20m thick, see Figure 9. The gravel and sand, which form most of the rest of the ground shown in this section, were part of the boulder clay, which was then reworked, first by meltwater and then by rivers. The melting ice produced very large volumes of water, with great erosive power. Meltwater almost certainly created the valley now occupied by the river Ribble. The meander belt between the river cliffs is too wide to have been created by a river of the size of the present-day river Ribble. This is discussed further in Section 7. Rocks found within boulder clay are known as erratics, unless they are of local origin. ‘Erratic’ literally means ‘wandering’ – ice has moved these rocks a long way from their place of origin; in some cases from southern Scotland, a distance of over 100 miles. The only natural mechanism which could have moved these large boulders is ice – water can move smaller rocks either by rolling/bouncing larger pebbles along the bed of a stream or carrying smaller fragments in suspension. Wind is able to move only even smaller particles. The name erratic is not restricted to large boulders; some small ones are displayed in the Welcome Centre. The most important factor in identifying these as erratics is the fact that they are of rock types which do not occur in the local area. 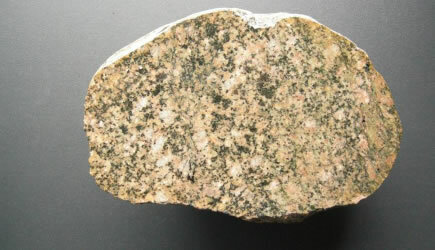 Granites are especially useful in this because each granite mass, having cooled from molten magma, has slightly different minerals and each one has its own unique ‘signature’. The variety of rock types to be found in the Brockholes area will be discussed in Section 5.
more easily recognised glacial erratics which you may find at the reserve. The largest and most obvious of these erratic boulders is to be found between the Brockholes Trust Office and the car park. There you will find a large pale-coloured boulder, which has travelled from the Lake District or the south- west of Scotland, see Figure11. No rocks of this type, an igneous rock called granodiorite, are exposed at the surface within the river Ribble catchment area and we can be absolutely certain that it cannot have washed in from upstream and must therefore be an erratic. It probably achieved its final polish in the bed of the river. Figure 11 Large erratic boulder of an igneous rock called granodiorite, from the gravel pit to the west of the M6. It weighs about 2.5 tonne. Most glacial erratics at Brockholes are much smaller. iron-magnesium minerals. 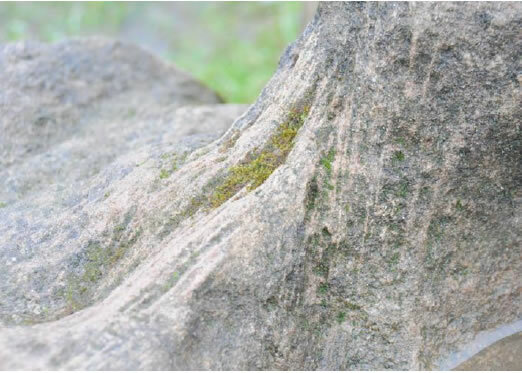 Careful examination of this boulder reveals small dark lines which were probably caused by pressure changes while the minerals were crystallising from the molten magma, see Figure 13. Figure 12 Close up of the granodiorite erratic with a 2p coin for scale. The feldspar crystals, of more than one species, are white and opaque and tend to have regular margins. The quartz crystals are translucent, like clear bottle glass; they fill the spaces between other crystals so their margins tend to be irregular. The dark crystals are of several different mineral species, all of which contain higher proportions of iron and magnesium than the feldspars. Quartz contains no iron or magnesium. Figure 13 Lines of dark minerals, probably indicating stresses during cooling of the magma. The presence of the large granodiorite erratic by the office is almost sufficient on its own to tell the whole story of the site. That boulder was transported from the Lake District or Scotland, which could only have been done by ice, and its surface has been smoothed by glacial and fluvial processes. 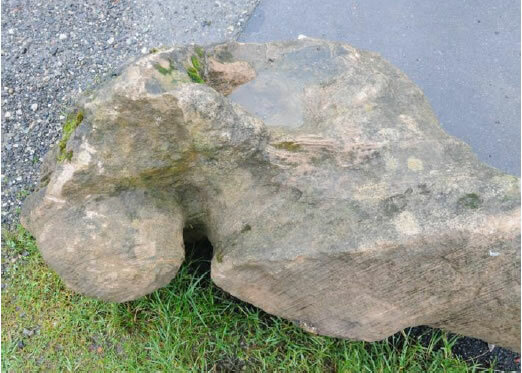 This boulder was found in Lower Brockholes gravel pit, just a few hundred metres away. Erratic boulders, whose place of origin can be identified, enable ice-sheet and glacier movements to be reconstructed. The ‘Erratic Circle’ near the children’s play area also has a collection of interesting erratics, of various rock types, some of which are described below. Rocks can be divided into three main classes – igneous, sedimentary and metamorphic. Igneous rocks are produced at depth within the earth under conditions of great heat and/or pressure. If the molten rock cools slowly within the earth’s crust it is described as plutonic and is characterised by large crystals. 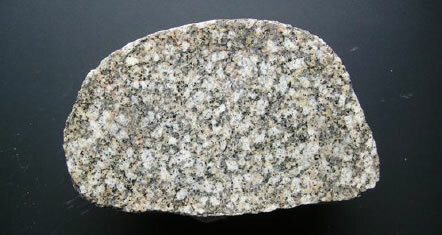 Granite is a typical plutonic igneous rock. Granite is a coarsely crystalline rock which solidified from molten magma in the core of a volcano and is therefore described as igneous. After cooling very slowly, so that there was time for large crystals to grow, the rock was brought to the surface by uplift of the earth’s crust followed by the erosion of several kilometres of covering rock. Crystals of the minerals in granite are large enough to be seen clearly with the naked eye. ’Crystals’ of minerals in igneous rock look very different from ‘grains’ of sand found in sandstone. 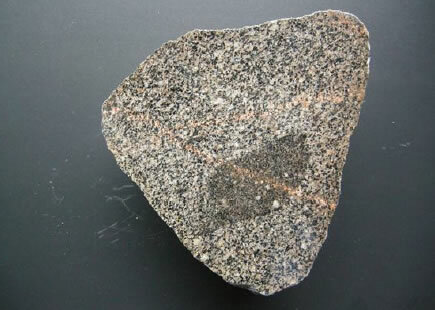 Granite often contains pink and white crystals, with the space between them occupied by smaller translucent crystals and occasional tiny black ones. The pink and white crystals are feldspar and these commonly have regular margins and flat surfaces. These minerals crystallise at high temperatures so are the first to form and can develop good crystal faces. The translucent crystals are quartz, which crystallises at much lower temperatures than feldspar and so fills up the spaces between the feldspar crystals. 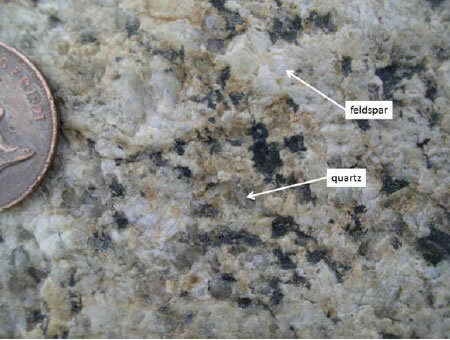 In some varieties of granite there are no pink feldspar crystals. 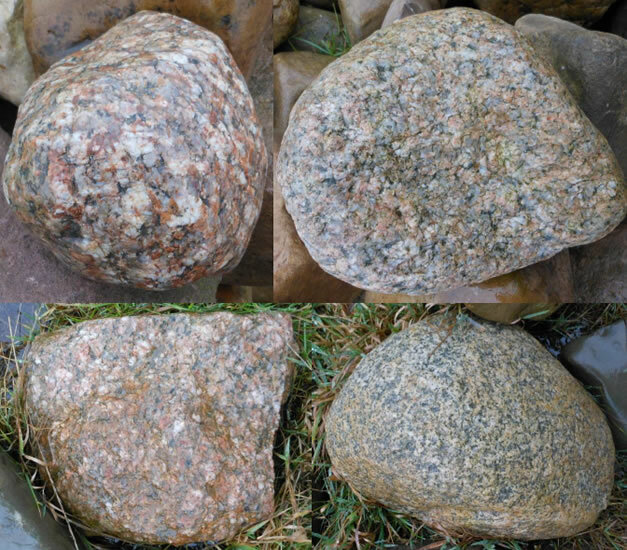 It is often possible to identify the source of granite erratics because granites have a wide variety of crystal size depending on their cooling history. In addition the original melts had different chemical compositions and so the type of crystals and their relative abundance is also diagnostic. Granodiorite is within the granitic suite of igneous rocks with crystal size similar to that of granite. The relative proportion of calcium, sodium and potassium silicates differs from those in a true granite. If the molten rock is erupted from a volcano or extruded at the earth’s surface as a lava flow, it is described as volcanic and is characterised by small crystals or may even be vitreous like glass. Volcanic lava, such as emanates from volcanoes on Iceland, Hawaii, Japan or Sicily, is unlikely to be found at Brockholes, although ancient volcanic rocks can be found in parts of Scotland and Ireland. There are, however, erratics of volcanic origin, which were brought by the ice from the Borrowdale area of the Lake District. These rocks have a characteristic blue-green colour. 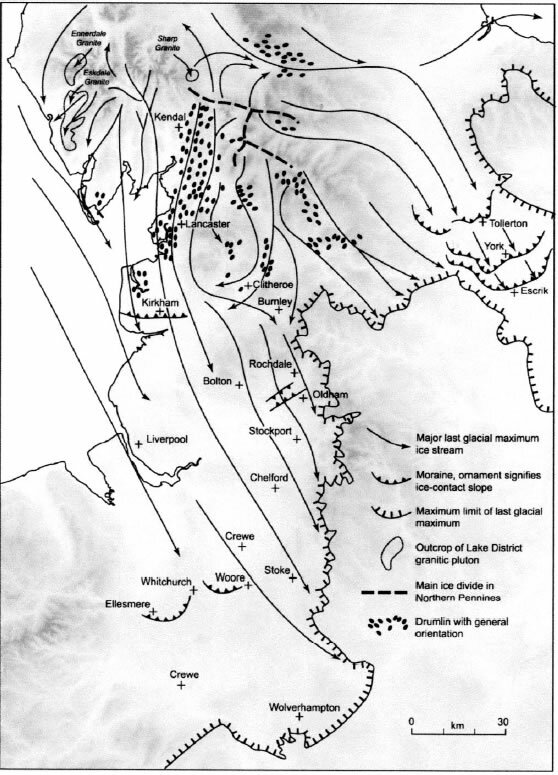 The Lake District was a centre of volcanic activity about 500 Ma ago, with explosive volcanoes which produced large volumes of ash. This ash rained down and formed layers rather like a sedimentary rock. In some cases the ash fell into water producing a different sort of sedimentary rock. Some of the volcanic rock was in the form of larger fragments, which fell into the ash layers and resulted in a ‘conglomerate’ – a rock with a fine matrix surrounding rounded clasts, or ‘breccia’ where the clasts are angular rather than rounded. Examples of all these can be found in the erratics at Brockholes. All rocks at the earth’s surface are exposed to the action of weathering. Rain, snow, frost, wind and the action of waves along the shore, attack the rocks, causing them to be broken down in to smaller fragments. In some cases the rocks can even be dissolved by the weak acid in rainfall, produced by dissolving Carbon dioxide (CO2) in rainwater in the atmosphere. These fragments of rock may then be moved by agents of erosion, rivers, the wind, the sea etc and redeposited, usually under water, but sometimes in sand dunes. Over long periods of time, these layers of sediment may become new rocks – sandstone if they are mainly composed of sand grains or limestone if they are made of shelly fragments or the remains of marine animals such as corals. An important difference when trying to identify rock types is to decide whether the rock is made of separate fragments which have become ‘stuck together’ or whether the rock has crystals which have grown from molten rock and are interlocked. Figure 21 Two erratic boulders of similar size and containing many of the same minerals, but with very different histories. The one on the right is granite, cooled from molten magma and consisting of interlocking crystals. 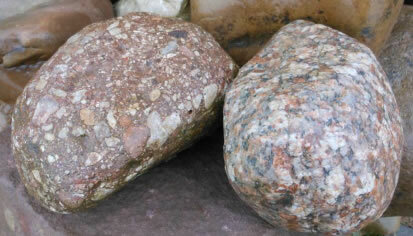 The one on the left is made up of many different rounded pebbles, fragments of older rocks, which have been weathered and eroded before being brought together to make this coarse conglomerate. The granite is igneous while the conglomerate is sedimentary. 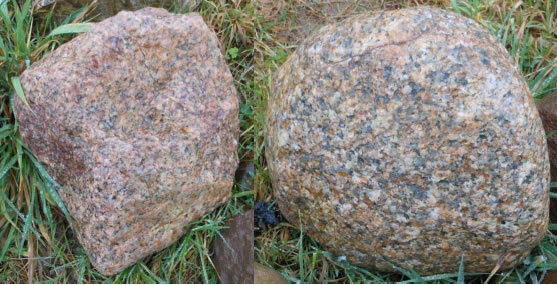 Figure 21 shows two erratics of similar size and colour, but the one on the left is made from rock fragments and is sedimentary, while that on the right has interlocking crystals and is igneous. Limestone is a sedimentary rock, which may vary in colour from pale grey to almost black. It is the rock type most likely to contain fossils. Limestone consists predominantly of calcium carbonate. The fragmentary ‘hard parts’ of marine animals and algae, both of which are made of calcium carbonate, are ‘cemented’ together by more calcium carbonate to make limestone. Nearly pure limestone, of which chalk is an example, is almost white. When contaminated with terrestrial sediment or with organic carbon, the colour of limestone is darker. Limestone originates as sediment in warm tropical seas, remote from significant sources of sediment coming from the land. The limestone- producing animals need clean water. The organisms evolved over geological time, so the fossils found within limestone give a very good indication of its age. Beds of limestone, formed in Carboniferous times about 320 Ma ago, can be found around Clitheroe (see the Clitheroe geotrail guide). This limestone erratic at Brockholes could have come from the Clitheroe area. 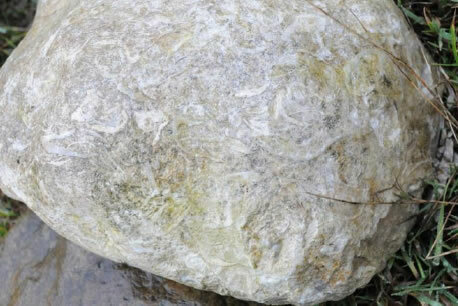 Figure 22 Limestone boulder packed with fossil brachiopod shells. Layers or lenses of chert are commonly found in limestone. 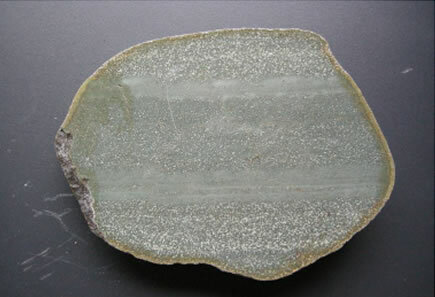 Chert is composed of silica and is highly resistant to erosion. Chert and flint are both composed of silica and one could reasonably say that chert is to limestone as flint is to chalk. 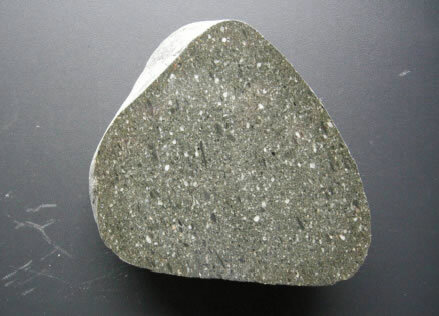 Chert is dark grey or black and pebbles of it can often be found in gravel banks located on the inside of bends in the Ribble. It is almost certain that the origin of the silica in chert and flint was biological. Sponges extract silica from sea water to make spicules and remains of spicules can sometimes be found in chert, for instance in the Chatburn Limestone which crops out near Clitheroe. Spicules can only be seen with aid of a microscope. Figure 23 Limestone boulder with (dark) band of chert. Sandstone, as its name implies, consists of grains of sand cemented together to form a rock. The surface of sandstone often feels like sandpaper. The sand grains and cement are usually made of quartz, a crystalline form of silica. The sand was laid down in layers, so sandstone, like limestone, is a sedimentary rock. Sand may be deposited under water or in deserts. Most of the sandstone in the Ribble catchment, such as that of Pendle Hill, was originally submarine sediment. 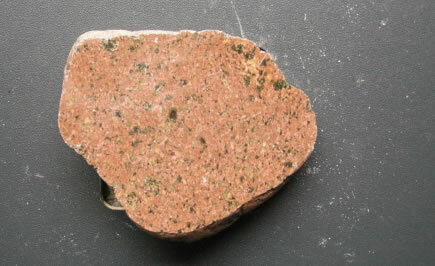 The red Triassic sandstone found near Preston is of desert origin. In sandstones one can often see layers that represent the episodic nature of the original deposition. 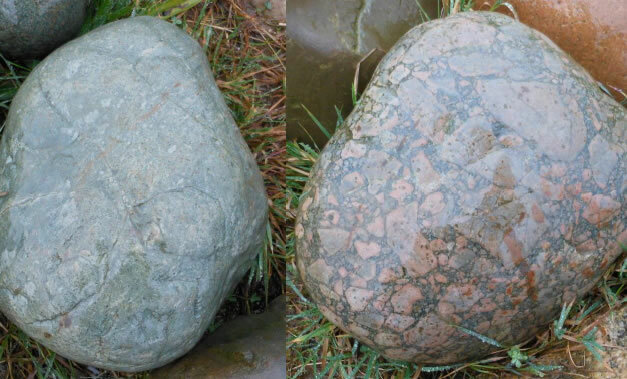 Sandstone erratics do not normally have sufficiently distinctive characteristics to allow their place of origin to be determined, although, at Brockholes, red sandstone boulders are likely to be Triassic sandstones of local origin. ‘Grey’ sandstone containing mud and fine quartz sand is sometimes described as greywacke. Sandstone boulders found at Brockholes may or may not be erratics. The chances are that they are of local origin as Longridge Fell and Pendle Hill, for instance, consist mainly of sandstone and are close to Brockholes. However, even red Triassic sandstone may have been picked up by an ice-sheet as it crossed Morecambe bay. Two sandstone boulders, each about a metre across, are located at the Welcome Centre end of the car park, see Figures 25 and 26. These are a puzzle. The boulders consist of quartz sand grains cemented together by calcium carbonate. It seems certain that these boulders are erratics, but carbonate-cemented sandstones are not very common and the source of these boulders is unknown. The sand grains at the surface are abrasive, like sandpaper, but the shape of the boulders resembles the shapes seen in limestone pavement. This was a clue to the carbonate cement, later confirmed when it was found that the rock fizzed violently when drops of dilute hydrochloric acid were sprinkled on it. A period of sub-aerial exposure would have been required for the boulders to achieve their present shape. This is inconsistent with them being transported in an ice-sheet and deposited in boulder clay. Rocks in situ can be difficult to identify but it is much more of a challenge when they have been transported many miles from the place where they crop out. We look forward to solving the mystery of these two boulders. Figure 26 Cross bedding in sandstone boulder with calcareous cement. When any rock, igneous or sedimentary, is subjected to high temperature and pressure its mineralogy will be altered by destruction of old and formation of new constituent minerals. Deep burial and involvement in mountain-building processes lead to metamorphism. Metamorphic rocks are the most complicated of all rocks because the source rock may be of any type whatsoever and there is an unlimited variety of pressure temperature histories that the rock may have been subjected to. Metamorphic rocks may even have been re-metamorphosed by a subsequent and unrelated temperature pressure event. High grade metamorphism occurs where crustal rocks are buried beneath mountain ranges such as the Andes in South America. A classic sequence of metamorphism is mudstone being compressed until it becomes slate. Further metaporphism would change the slate into phyllite, then into schist and finally into gneiss. If further heat and pressure affect the gneiss, it melts and beomes an igneous magma, cooling to form granite. This is part of what is known as the Rock Cycle, where rock is continually created, eroded, deposited, buried, metamorphosed and created again as new rock. 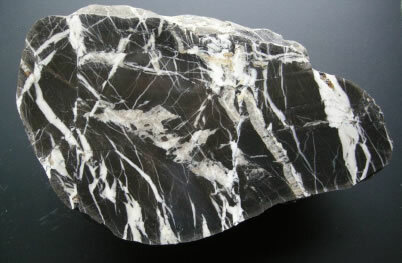 One well known metamorphic rock is marble, formed by re-crystallisation of limestone. One would describe the alteration of limestone to marble as low grade metamorphism because the temperatures and pressures involved have not been very high. This kind of metamorphism can happen where limestone is ‘baked’ by being near a volcanic or igneous heat source. Quartzite is another low grade metamorphic rock, consisting of crystalline silica. Temperature and pressure conditions have resulted in the sand grains and silica cement being recrystallised. In the Lake District is found a wide variety of igneous rock types collectively known as the Borrowdale Volcanic Group. These originated as ejecta from volcanoes more like Mount St Helens than those of Hawaii or Iceland. Much of what was ejected was dust, which was deposited in layers of coarse and fine particles. Some of the dust was washed into lakes where it was reworked and re-deposited like fine grained sandstone. Much later mountain building episodes subjected these deposits to high temperature and pressure so new minerals were formed and the finer grained rock became slate. It is green because one of the metamorphic minerals, chlorite, is green in colour. 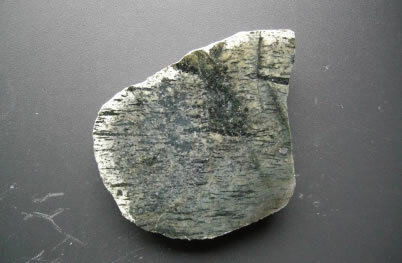 Green slate from the Lake District and similar slate from North Wales is of igneous origin, was deposited as sediment, and was later metamorphosed. The generic words igneous, sedimentary and metamorphic are useful in rock description but they are by no means sufficient. We wish to thank British Geological Survey (BGS) Edinburgh for providing information about the age and origin of some of the erratics. Several specimens were cut and polished; some of these can be seen in the geology display in the Welcome Centre. These erratics are of a pink, medium-grained granite from Eskdale in the western Lake District and are 450 million years old. It has travelled about 100 miles in the ice sheet to arrive at Brockholes. The area was rather like the Andes mountains of South America today where volcanic activity and earth movements cause the crust to melt at great depth, the molten rock then moving up through the crust to cool slowly and form a granite pluton. This is a granite from the Southern Uplands of Scotland, probably Galloway so the rock has travelled more than 100 miles to get to Brockholes. It is over 410 million years old – at this time what are now southern Scotland and the Lake District were on opposite sides of an ocean which was closing, with enormous amounts of volcanic activity and earthquakes. This is an igneous rock formed from molten magma which cooled slowly deep in the earth’s crust to form a crystalline rock with large crystals mostly of three minerals – quartz, mica and feldspar. 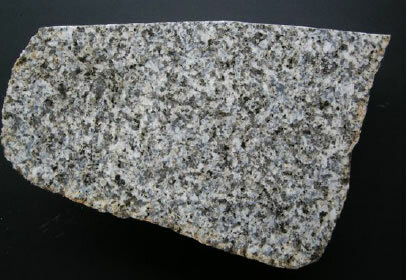 Figure 30 Granite from the southern uplands of S W Scotland. This granite is about 425-410 Ma old and has travelled about 100 miles to get to Brockholes. This erratic is from the Loch Doon Pluton (a large mass of rock which was intruded into the earth’s crust about 408 million years ago, as molten magma and cooled slowly at great depth. Loch Doon is in southern Scotland so this rock must have travelled over 100 miles, being carried along in the ice during the last glaciation before being deposited at Brockholes. The smaller crystals in this granite indicate that it probably cooled quite rapidly, so that there was not time for large crystals to grow. This is from the Dumfries and Galloway area of southern Scotland. It was intruded into the earth’s crust as volcanic rock and is part of a feature called a dyke. It would have cooled quite rapidly at or near the earth’s surface and is fairly fine grained. It is probably about 410 million years old. It has been carried for over 100 miles by the ice sheet which brought it to Brockholes. 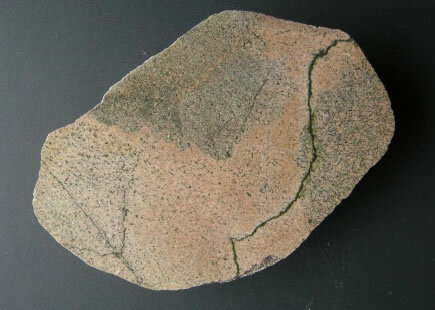 Figure 35 is an erratic composed of fragments of volcanic rock, which would have been blasted from a volcano in the Borrowdale area of the central Lake District about 450 million years ago. This would have been a very explosive event with a great cloud of sense, burning ash rolling down the flanks of the volcano rather like the Mount St Helens eruption in 1981 in the western USA. The rock is called a rhyolitic ignimbrite and it has travelled about 90 miles from the Lake District to be deposited from the ice sheet which carried it to Brockholes. 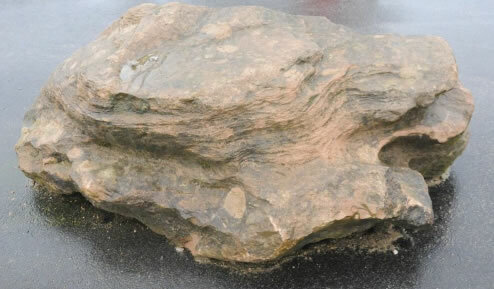 This rock, a water-lain tuff, is composed of fragments of volcanic rock, which would have been blasted from a volcano in the Borrowdale area of the central Lake District about 450 million years ago. It consists of flattened fragments of pumice and ash which were flung into the air before falling into water. It is possible to see the bedding in this rock, formed as particles of different sizes became sorted as they fell through the water – this is called graded bedding. This rock travelled about 90 miles in the ice sheet which brought it to Brockholes. This rock, a water-lain tuff, is composed of fragments of volcanic rock, which would have been blasted from a volcano in the Borrowdale area of the central Lake District about 450 million years ago. It consists of flattened fragments of pumice and ash which were flung into the air before falling into water. It was carried for about 90 miles by the ice sheet which brought it to Brockholes. This rock has not travelled as far as many of those found at Brockholes, probably less than 20 miles. It is made of Chatburn Limestone, and is of Carboniferous age, about 330 million years old. It is a dark grey limestone with some chert (a rock like flint which occurs in chalk) and many calcite-filled veins. Thornton Limestone occurs in the upper Ribble valley, so these erratics have probably not travelled very far. This limestone is 330-325 Ma old and is a muddy, grey rock with shell fragments and chert bands. These are rather impure limestones. Figure 40 contains fossils. Most limestone boulders probably originated in the Ribble valley. Limestone from the Lake District is of approximately the same geological age as that from the Ribble valley, so distinguishing between limestone erratics and limestone rocks moved by the river is normally not possible. One example of limestone in the erratic circle has a band of chert within grey featureless limestone. Another is full of fossil shell fragments. 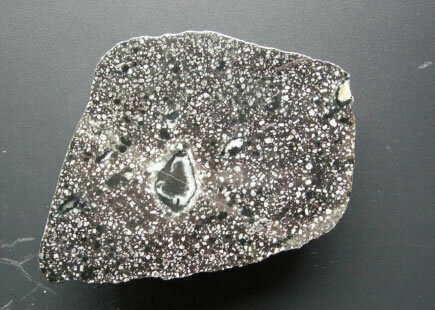 Figure 41 A sedimentary rock (greywacke) containing fragments of older rock from the Dent area. This is a sedimentary rock composed of fragments of limestone together with fragments of lava and volcanic ash from the Borrowdale Volcanic Group of rocks. The rock was laid down about 445 million years ago which means that it is of Late Ordovician age. It would have been deposited in sea water, flowing down an underwater slope rather like an avalanche. Such rocks are called turbidites. 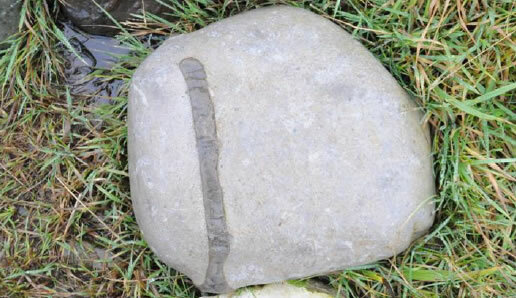 This rock probably came from the area near Dent east of Kendal and has travelled about 75 miles to get to Brockholes. Upstream from Preston the river Ribble occupies a valley with steep ‘bluffs’ between Ribchester and Preston. The valley is approximately one kilometre in width and the river meanders across this relatively flat flood plain. The development of meanders has been studied for many years. In his paper ‘The Development of meanders in natural river channels, E J Hickin, 1974 states that there is a relationship between the ratio of the radius of channel curvature to the channel width, which determines the ‘wavelength’ of the meanders. The most likely explanation for this discrepancy is that the river channel and the meander system were established at the end of the last period of glaciation, when huge volumes of water poured out from the melting ice sheets – see Section 4. Figure 42 shows the lower Ribble meandering between the bluffs. A series of four river terraces is shown as coloured areas, Cuerdale Terrace being the oldest, Ribchester Terrace the youngest. These terraces and river cliffs can be seen at Brockholes, where the river cliff delineates the northern limits of the reserve and the M6 can be seen climbing away from the river crossing. Until the bridges carrying the motorway were built, there was no river crossing between Walton Bridge and the bridge upstream of Ribchester apart from the A59 Brockholes Bridge. The terraces show the locations of previous meanders, such as the one just west of Brockholes reserve beneath the line of the M6. 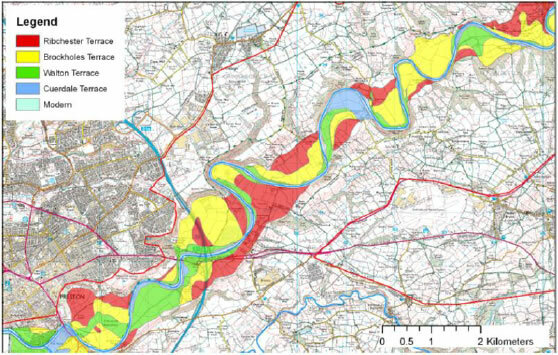 Brockholes reserve is in the large yellow area immediately east of the M6. The 1840 Ordnance Survey map shows that there were five ferries; near Samlesbury Church; near Elston Hall; near Baldeston Hall; near Osbaldeston Hall and the last to disappear, the Dinckley or Hacking ferry (marked as Trowers ferry on the 1840 map) near Dinckley, now replaced by a footbridge, see Figure 43. 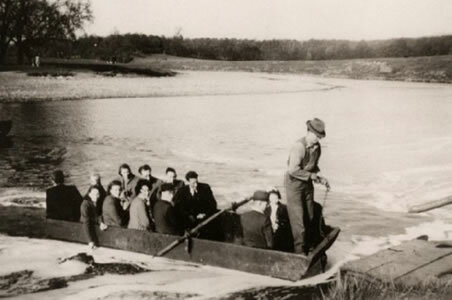 These ferries plus a ford upstream of Red Scar, were a vital transport link until very recently. Hickin (1974) describes the pattern of meander migration as ‘ridge and swale’. He states that the vegetation assemblage in each zone is influenced by the microenvironment and that these landforms can be identified from the air. 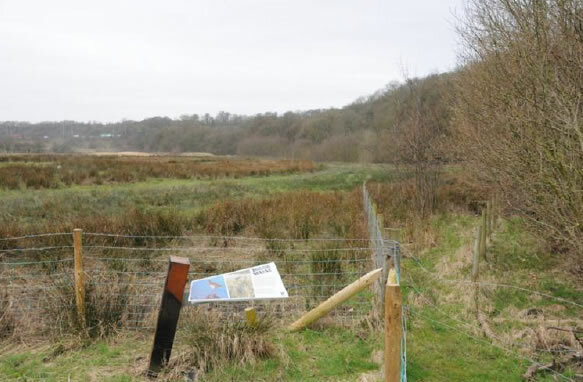 These zones can be seen at Brockholes, see Figure 44, although access to the abandoned meander is not possible because it is in an area of restricted access as part of the wildlife management regime at the reserve. The meander is visible as an area of reeds and rushes and marks the site of a silted-up oxbow lake. Figure 44 View from near the Boilton Wood sign board looking west. Boilton Wood, on the right, follows the line of an old meander. The wood is on the bank of boulder clay, now at a shallow angle as a result of landslips. The bank continues for almost a mile to the west. The A59 just on the Preston side of the M6 climbs up the bank of the same old meander. The ‘Red Scar Wood’ sign in the reserve is somewhat misleading. Boilton wood is to the west. Red Scar wood, which is outside the reserve, is adjacent to the next meander upstream below Red Scar village, which takes its name from reddened boulder clay exposed by repeated small landslips, see Section 9. 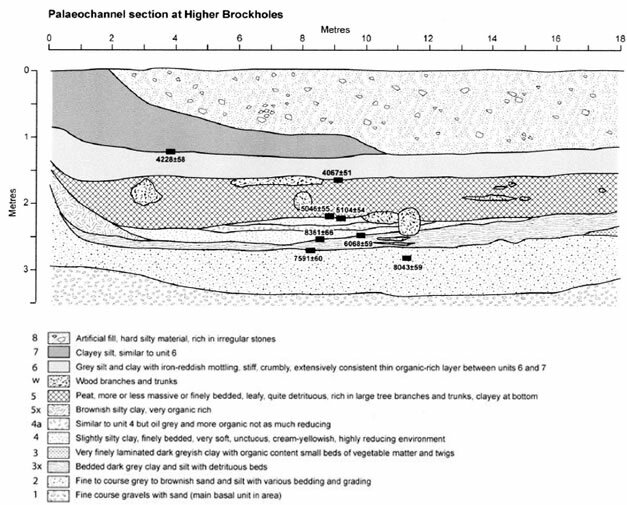 Figure 45 shows the meander at Brockholes. Most of the area is Terrace 2, the Brockholes Terrace in Figure 42. Several palaeochannels have been identified, indicating that the river has changed its course over time. The palaeochannel at C1 can be identified on the ground, although this area is reserved for wildlife and is not open to the public. 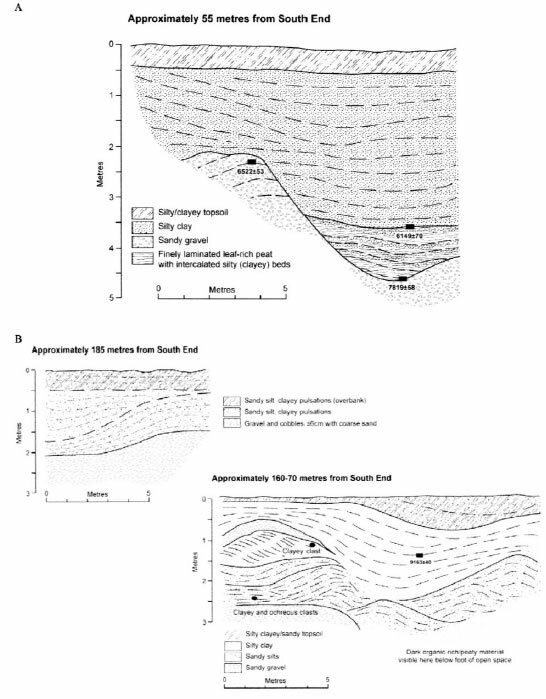 Figure 46 shows a section through the palaeochannel at C1 and shows the sequence of deposits which indicate the changing environment and vegetation of this area, Figure 47 shows results from other areas of the reserve and is further evidence of the changes in the river’s course over time. 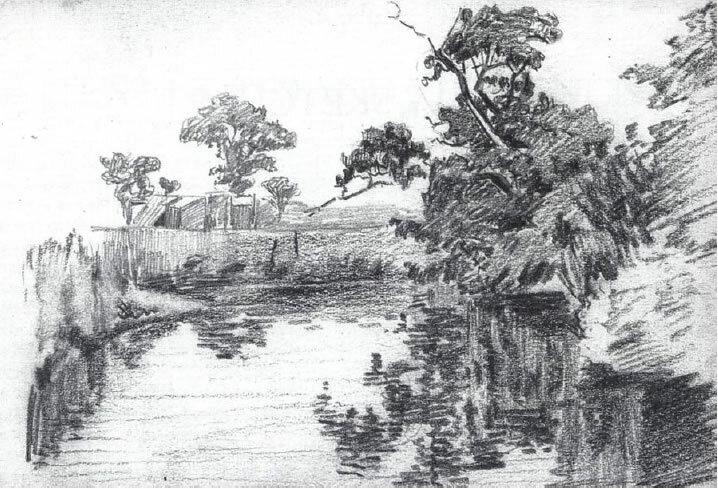 During historical times, human intervention to control the river channel and to prevent flooding have slowed and possible stopped this natural fluctuation in the river channels. Despite these efforts to control the river, erosion continues as will be discussed in the next section on landslips. As it meanders, the river Ribble cuts into deposits of boulder clay on the north side of the valley. The river undermines the boulder clay and repeated, probably slow moving, landslips move rafts of boulder clay into the river channel. This process has happened in the past and continues today at Red Scar, just upstream from Brockholes reserve. Brockholes are part of such a lag deposit, which is why gravel extraction took place at Brockholes – see Section10. Occasional periods of high river flow moved coarser gravel downstream, forming shingle banks like that on the south side of the Ribble near Walton Bridge (see the Preston geotrail). The Brockholes area was, however, not depleted of gravel because more washed in from upstream to replace it. Large boulders were too big to be moved by the river, even in flood. As the river changed its course these remained in much the same position, probably sitting directly on the red Triassic sandstone that is the bedrock in this area. The larger rocks had already been rounded within the glaciers and ice sheets, but on the river floor they were ‘sand-papered’ by sand and gravel washed down river and as a result their surfaces became even smoother. 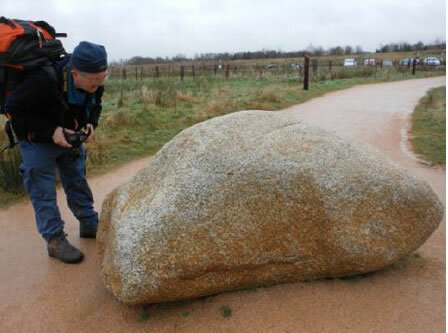 One of these large boulders weighing about 2.5 tonne can be seen beside the Trust Offices at Location 2 of the geotrail. The surfaces of gravel-sized rocks were also smoothed as they rolled about on the river bed. In the next loop of the river upstream, opposite the north east corner of the reserve, there used to be a small gravel pit. At the base of that pit was a layer of large boulders resting on bedrock. Today the northern margin of the Ribble floodplain from the M6 to Alston Old Hall is defined by landslips. The Ribble Way follows the top of some of these landslips as it leaves the Brockholes reserve to the north. The width and profile of the Ribble valley is the consequence firstly of very high river flows at the time of ice melt and secondly of much lower flow rates since. Evidence of landslips can be seen at the base of the slope on the northern margin of Brockholes reserve. The meandering river originally created steep slopes, but over the years the slope angle has decreased as material has slipped towards the old river channel on the southern margin of Boilton Wood. That channel has now filled up with sediment and has become an arc-shaped wetland. Similar arc-shaped wetlands in the Ribble valley provide evidence of other previous river channels. On a small scale, the process of winnowing, by which smaller material is washed downstream and coarser material remains as a lag deposit, can be seen today in the banks of the Ribble at the north east corner of Brockholes reserve. Here the river is undercutting its bank and several small landslips can be seen, some of which have created small islands near the river bank. In the shallows you can see gravel and rounded boulders up to half a metre across that have resisted the flow of the river. The original process by which the boulder clay was washed and a lag deposit remained was not a one-off event. The river has changed its course many times and each time the sediment has been reworked to leave a lag deposit. Some sand and mud remains in the space between the pieces of gravel, so the winnowing process is not perfect. Also, when the river in flood bursts its banks, mud is spread over the, aptly named, flood plain. Repetition of this process has concentrated gravel in the Brockholes area sufficiently for it to become a commercially viable deposit. The extraction of gravel left hollows which soon flooded and have become the basis of the reserve that you see today. 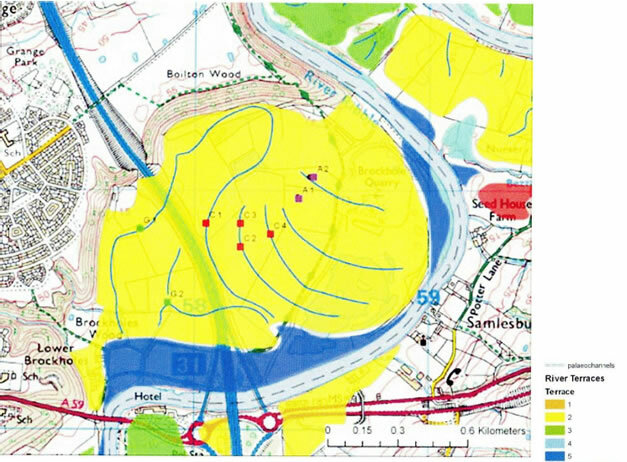 We thank Hanson for the following data, which arises from a programme of exploration drilling carried out by Hanson and others to assess the sand and gravel reserves at Brockholes prior to application for planning permission for extraction. Before quarrying, the surface of the flood plain was between 12 and 14 metres above sea level. The top of the red Triassic sandstone was consistently about 5 metres below the ground surface and typically much fractured, probably by ice-related processes such as freeze-thaw. The topsoil and peat combined were about 0.5m thick, leaving a potential reserve of sand and gravel 4.5m thick. In places the weathered Triassic sandstone bed rock had contaminated the sand and gravel so that it was not suitable as a sellable product on the grounds of colour and the gravel sized fragments were unsuitable because of their low compressive strength. The top of the Sherwood Sandstone, the red Triassic rock underlying the reserve, is 8m above sea level. Petrographic analysis, using thin sections of material from three boreholes, revealed the following lithologies (rock types) in the 5 to 20mm size fraction. The average composition of the reserve was 50% gravel, 42% sand and 8% silt. The gravel was hard quartz sandstone which met the requirements for concrete aggregate. The sand met the requirements for use in concrete, building and asphalt manufacture and it was for these reasons that Hanson progressed with a planning application and ultimately extraction. 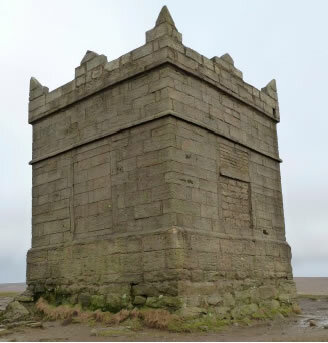 An area about 300m east-west by 200m north-south, located in the corner between the Ribble Way and the southern edge of Boilton Wood, was used for three silt lagoons, the silt being the waste arising from washing sand and gravel. Because of poor drainage and abundance of muddy sediment one would expect the predominant vegetation in this area to be different from that found elsewhere in the reserve. When work finished and the area was bought by Lancashire Wildlife Trust, the lagoons became an important part of the reserve. It will be interesting to follow the progress of the reserve as it matures. Sand and gravel extraction is currently under way on the western side of the M6 in a deposit which mirrors that at Brockholes. The naming of igneous rocks, whether originally ejected from a volcano or solidified from a melt, is not straightforward. Igneous rock chemistry ranges over a wide spectrum of silica and alkali content, to name just two of the key chemical variables. Names are related to bulk rock chemistry and crystal size, but within boundaries established by convention and not because they are associated with readily observable changes in rock characteristics. Non-specialist geologists would be likely to describe a pale, coarsely crystalline igneous rock as granite, even though it may be granodiorite for instance. The large pale erratic boulder by the office is granodiorite. It weighs about 2.5 tonne. You can see that it is crystalline from the close-up photograph or better still if you examine it with a hand lens. Igneous rocks, whether intrusive (cooled and crystallised beneath the earth’s surface) or extrusive (cooled quickly from a molten state at the earth’s surface), are traditionally divided into three classes, acid, basic and intermediate. These classes are sufficient for our purposes, but technically much oversimplified. For more precise categorisation there are good undergraduate text books, one of which is listed below. Granites are traditionally describes as ‘acid rocks’ not because of pH but because of their high silica content. If igneous rocks formed directly from a melt, whether quickly cooled like lava or slowly cooled like granite, contain greater than 63% silica (SiO2 oxide analysis) they are described as acid. Silica is present in granites as quartz and in silicate minerals such as feldspar. When expressed as an ‘oxide analysis’ all silica is included, whatever its form. Granite, microgranite and rhyolite are acid igneous rocks of the same chemistry in order of decreasing crystal size. The crystals in rhyolite are too small to be seen with a hand lens. Basic rocks contain less than 52% silica and ultra-basic less than 45% (oxide analysis). Gabbro, dolerite and basalt are basic igneous rocks of the same chemistry in order of decreasing crystal size. The crystals in basalt are too small to be seen with a hand lens. Volcanic lava, such as emanates from volcanoes on Iceland, Hawaii or Sicily, is also igneous but no rock of this type is likely to be found at Brockholes.